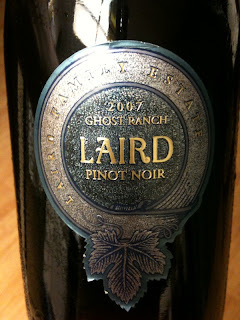 Amant Du Vin: Laird Pinot Noir 2007 "Ghost Ranch"
Laird Pinot Noir 2007 "Ghost Ranch"
I love a good Pinot Noir and I found one in Laird Pinot Noir 2007. The wine came from Ghost Ranch in the Carneros which is a wonderful AVA that straddles both Napa and Sonoma and known for its Pinot Noir and Chardonnay (think Burgundy). The wine looks lovely in the glass, a light clean garnet. The nose was medium (-) intensity delivering cherries, rapsberry, a little strawberry and just a touch of earthiness that I really like in my Pinot Noir. The wine is medium (-) bodied, juicy acidity, almost mouthwatering with just enough smooth tannins to create a fine medium length finish. A juicy, subtle (for California) experience that I really enjoyed. Mason Sauvignon Blanc 2007 "Napa"